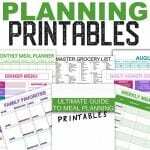 Get your Free Meal Planning Printables sent right to your inbox. Meal planning is easy once you find your grove. Meal planning printables will help you do this. My Ultimate Guide to Meal Planning free templates will help you get organized. 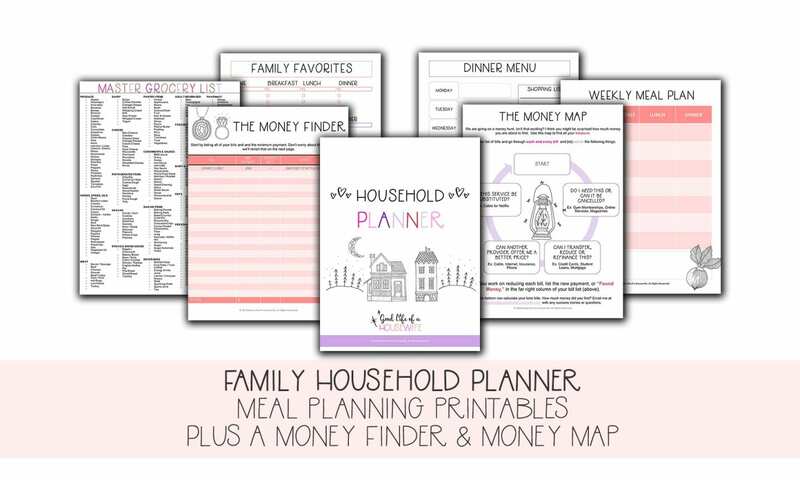 This guide includes a print out of your family’s favorite meals, a master grocery list with over 250 popular items you purchase at the grocery store, a weekly meal planner and a monthly meal planner. Family Favorites: Have your family write down their favorite foods. This is an easy way for everyone to get their favorite meals included on the menu. Master Grocery List: Print the Master Grocery List and keep it on the fridge. Highlight items as you run out, or as you need new ingredients. Weekly Menu Plan: The Weekly Menu Plan is used to elaborate on the Monthly Menu Plan. In addition, you can plan for breakfast and lunch. This is the perfect place to add weekly sale items to the menu. Monthly Menu Plan: A monthly menu plan is used by filling in designated meals for the month. M­ainly the big one: dinner. Schedule easy meals and leftovers on your busy days. 30+ Daily Dinner Ideas: A list of dinner themes and ideas to create new meals for your family menu planning.